What Does it Mean to “Sleep Clean”? 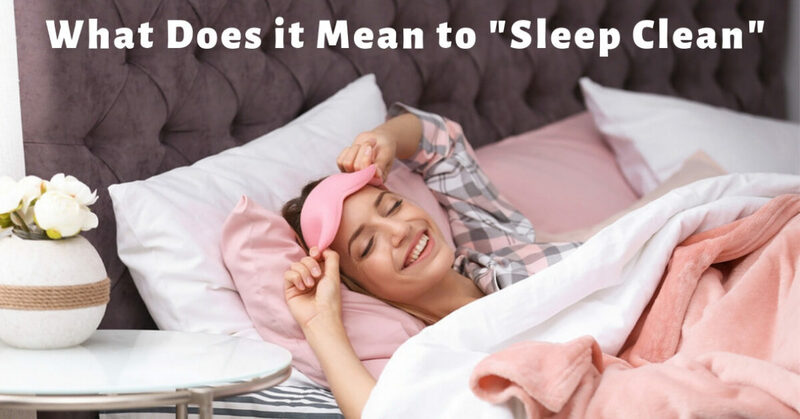 Have you heard of the ‘sleep clean’ trend, and wondered what it meant? Gwyneth Paltrow used the term to start a huge health trend in 2017, making us all more mindful of our sleep habits. The idea behind clean sleeping is to fix your sleep habits and impact positive change on your overall health and wellbeing. It’s estimated that over half of Americans aren’t happy with their sleep, but very few are making changes to get a better night’s rest. Clean Sleep is based on the principle that sleep is fundamental for overall health. Poor sleep can disrupt metabolic function, throw hormones out of sync, increase bad moods, lead to weight gain, impaired memory, and brain fog, and even interfere with the immune system, leaving your body susceptible to a host of viral and bacterial infections and illnesses. Clean sleeping is intentionally getting great quality sleep, so you’ll make sure you’re waking up well rested and relaxed, and ready to face the challenges of the day in good health. Getting a great night’s sleep has a lot of positive health outcomes. Doctors recommend getting 7 to 8 hours of sleep per night, and if you have any children or teenagers in the house, they should be sleeping 9 or 10 hours per night. Among the many health benefits of sleeping clean are lower levels of stress, and less irritability. You’ll be more likely to eat healthier, and won’t need to reach for sugary foods in an attempt to find some energy. You’ll have a stronger immune system, and be less susceptible to developing a cold or flu. You’ll even notice improvements in your memory, and be able to recall things easier. Ready to start sleeping clean? Following these tips will help you get the sleep you need to have a healthy and happy life. Routine: One of the first things you’ll need to do to sleep clean is develop a great sleep routine. Try to go to sleep and wake up at the same time each night, and allow your body to adjust to that rhythm. Avoid looking at any screens in the last hour before you go to bed, and keep the TVs, computers, and phones out of the bedroom. Instead of keeping your mind active with technology, wind down with a relaxing bath, reading a book, or spending time with your loved ones playing games or chatting. Don’t eat before bed: You might be tempted to reach for a bedtime snack, but munching before heading to bed could be keeping you awake. Every night, you should have between 10 to 12 hours in which you don’t eat. If you normally eat breakfast at 7:30am, that last thing you eat the night before should be at 7:30pm. Abstaining from food for 12 hours will allow your body to detox during the night, but it can only do this if you avoid snacking right before bed. Not only that, but a study by the American Journal of Gastroenterology found that late-night snacking can cause acid reflux symptoms that will keep you up at night. In general, avoid junk food or sugary drinks at any point throughout the day, as these will affect your ability to get a good night’s sleep. Meditate: Meditating isn’t expensive, and you can easily do it in your own home, using a simple app. Practicing mindfulness or meditation calms your mind, allows you to focus on your breathing, and relax. The stressors of the day will melt away, and you’ll feel yourself growing more and more calm with each breath. Focus on how your body is feeling at that exact moment, and see what feelings or sensations come up. Don’t dwell on any thoughts, but let any thought cross your mind, and leave your mind without giving them any importance. Meditating before bed will help you sleep clean, and wake up refreshed, ready for any new challenges the day might throw your way. Looking for the perfect solution to a great night’s sleep? At Sound Sleep Medical we’ll help you figure out why you’re not sleeping, and work with you to find a solution that will have you sleeping deeply all through the night.